May and I called on Mattie and Jessie. Went down town. Mother came over. May and I went to Ideal. E. would not go with us. Rather go to Club. I wonder if he will ever go anywhere with us. Emma Gilson's funeral. May and i went over home in P.M. Went down town in eve. May stayed over to supper. Played "500". Pa and I trimmed them. May went over home to dinner. Nellie and Fred & Mr. Buck came in. We all went home in eve. Fred and I made candy & popcorn. Emma (Downes) Gilson died of pneumonia. Jinnie Murphy buried in Florence, Mass. Goods came from Gilchrist. May and I went to Ideal. Went over home and down town in eve. Ada is on the right. Picnicking with friends around Springfield, Vermont. Went over home in P.M. with May. Played "500" in eve. Pa and I trimmed Ma & Fred. Club at Mrs. Flinns. (sic) Shiela (sic) came over to see May. Washed all alone. E. & May & I stayed over home to dinner. Went down town. Called on Mrs. Lucas. Fred and Ma beat Pa & I. Lawyer Davis has a son. May played out doors. King's Daughter food sale - Gave doughnuts. Went over home and down town. Plumber fixed bath room. Mrs. Jacobs returned from hospital. Mrs. Hughes came in. Mr. Wheeler bought store at Claremont. Ray manages it. Went over home. Pa and Fred came in. Do not feel well. Note: Ada uses the cross hatch to indicate the first day of her period. She nearly always says something along the lines of "do not feel well." It seems like the first day was generally rough for her. I think the "Ray" she refers might be a relative - she talks about "Ray and Mattie in Claremont" at other times. Claremont is the town across the Connecticut River from Springfield in New Hampshire. Put in new water meter. May and I stayed home all day. Taylor (Harry) chimney burned. Ernest stayed in. May and I made paper dolls. May did not go to church. Went over to grandma's to dinner. Mr. Buck called. Complained of water bill. Went over home for supper. Went over home. May and I went down town. Bought May gray toque and scarf. Went to Ideal with Ernest & May. Ernest had a sick headache. May played out in A.M. and P.M. Went over home. Pa and I beat Ma & Fred. Masons went to Chester. E. could not go. Herm sick. Mother better. Mended. May played out in A.M. Went over home in P.M. Played "500" in eve. Pa & I beat Ma & Fred. Ernest went downtown. May played too. Alice Coburn's + Harry Beal engagement announced. May played outdoors all A.M. Went over to Mary's and downtown with May in P.M. Bought "Sir Galahad" and brought up a dress. Went home in P.M. and eve. Note: I have no idea what Ada means by "Sir Galahad"
Note: The question mark in parentheses is Ada's. I don't know what it means. Monday E. went out Lovely day. May played out in A.M. Fell on ice in yard and hurt arm. Went to H.&S. sale. Bought some underwaists for May. Mary and Merrick came over in eve. Ada (in the middle) on a picnic with friends - about 1900. Probably somewhere near Perkinsville, Vermont. I love the "surrey with the fringe on top" in the background. May went to Sunday S. Took some pictures. Wilder's Livery stable burned. 8 horses - 3 cows - 1 man killed. "Mr. Richards" May and I went to fire and over home to supper. May played out nearly all day. Went over home in P.M. May stayed to supper with Grandma. we went down town in eve. May and I went over home. Went down in P.M. Went to club at Gertrude Finn. Mrs. Russel joined. Ernest cross. First time this year but will be everytime I go out. Fred worked at J&L. May was sick in P.M. Better in a little while. Went downtown. Saw Bill Slomer. Went home in evening. Bought a combination suit. Note: J&L is a machine shop in Springfield. Ada May Grimshaw - the earliest picture. Mother is better and May's cold also. Went to walk and over home in P.M. Ernest took May and I to the Ideal. Fred and pa came over got a letter from Inez. 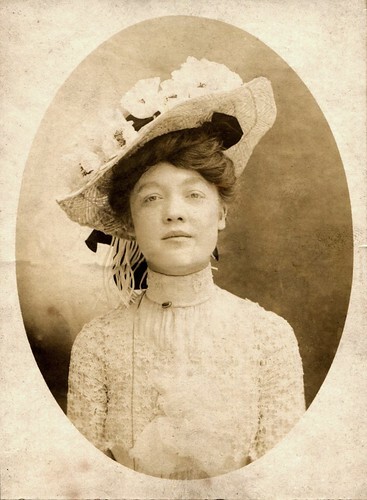 Note: Inez (Sumner) Illingworth b. Nov 22 1885/6 in Bellows Falls was married to Ernest's brother Archibald b. Aug. 16 in Bradford, York, England. Mother had doctor. Not as well. May has cold. Took some pictures of May. Got a letter from May and Sadie. Went over home in P.M. Ernest has gone to Lodge. May and I went over home. Did washing all alone. May and I went over to Marry [Mary?] W. in P.M. Fred came over in eve. Walter Bliss came. Note: "Grandpa" is her father - Ada also calls him "Pa"
Went over home in P.M. Mother is better. Fred came home. Bryant's closed. Went down town in evening with May. E. went out. Note: Bryants is a Springfield tool making factory.